This Easter dessert grazing platter is the ultimate budget friendly Easter dessert. It only takes 5 minutes to put together, and is under $20! Grazing platters are fast becoming my favourite dessert to serve when entertaining. They are so quick and easy to put together, and are a hit with everyone. Dessert platters are also a great way to cater for all tastes. By including a range of treats on a dessert platter, you are sure to please everyone. Any occasion can be celebrated with a dessert grazing platter. From birthdays to Valentine’s Day, Christmas and of course Easter, it’s easy to customise your platter to suit any occasion. Not sure exactly what a grazing platter is? Just like the name suggests, it’s a large platter filled with often bite sized finger foods. Grazing platters can easily be made larger or smaller depending on how many people you need the platter to serve. Dessert grazing platters are more than just a way to feed your guests. They also make an amazing edible centrepiece that is sure to wow anyone. You can easily add colours to your dessert platter to suit the theme of your event. For example, if you were throwing a pink themed party, you would add a range of pink food to your platter (think strawberries, pink marshmallows etc). I find the Easter grazing platter to be among the easiest to put together. With the range of Easter goodies around at this time of year, there is no shortage of delicious treats to include. 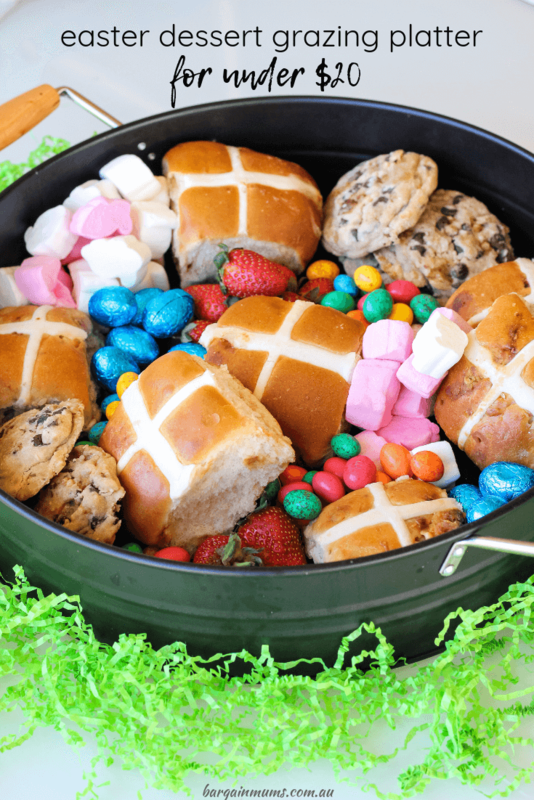 Hot cross buns are the perfect centrepiece for your Easter platter. There are plenty of amazing hot cross bun flavours around this year, so why not choose a few different varieties to add interest to your platter. Who doesn’t love Woolworths’ new White Choc and Raspberry or Banana and Caramel Hot Cross Buns? After you’ve selected your hot cross bun varieties, choose a few different bite sized Easter treats. Look for packets of mini Easter eggs and other Easter themed treats. Finally, consider including some bite sized fruit to go alongside the sweet treats. It’s always nice to have a healthy element to add to your platter, and berries are the perfect addition. Choose an appropriate sized serving platter or tray. The more people you are serving, the bigger your platter will need to be. The more colour your dessert grazing platter includes, the better. Start by placing the larger items on your grazing platter, and fill in the gaps with the smaller items. If you have any items left over that don’t fit on your grazing platter, serve them on the side. Also, consider small paper bags for guests to take some goodies home with them. Ready to make a grazing platter for Easter? All of the hard work has been done for you. Simply take the following shopping list into your local Woolworths store and you will have all the ingredients needed to make your very own Easter grazing platter. Before you make a start on your Easter grazing platter you will need a tray or platter. The size platter you require will depend on how many people you are serving. I use a metal tray with sides, but a platter without sides can work just as well. Once you have found a suitable platter, it’s time to start assembling your masterpiece. Start with the hot cross buns, as these are the centrepiece of the platter and will take up the most room. My tip: the hot cross buns look best placed in a random pattern over the serving platter, so that the gaps can then be filled in with the smaller items. Next, place the salted caramel cookies in a similar fashion to the hot cross buns. Following the cookies, use the punnet of strawberries to make a few piles of strawberries in amongst the hot cross buns and cookies. Finally, fill in the remaining gaps with the mini Easter eggs and Easter bunny marshmallows.